A little break from Christmas today. I have been practising making these tri shutter cards.I find them a little fiddley, still working on a simpler way to do them, but I like the effect so I will perservere. All paper is from the kaisercraft botanica 6″ pad, and I used a couple of the matching collectables and prima flowers and ribbon.I also inked all around my edges with tea dye distress ink to define the papers.the happy birthday die cut is a spellbinders die, but i see kaisercraft have brought out a happy birthday die this month, so i will have to investigate because I love the way they cut. Til tomorrow…. happy 1st of spring day!! Happy 1st of spring day ( or Autumn day if you are a visitor from the northern hemisphere). the weather here is glorious… my kind of weather, not too hot, sun shining, I can feel my bones thawing out! 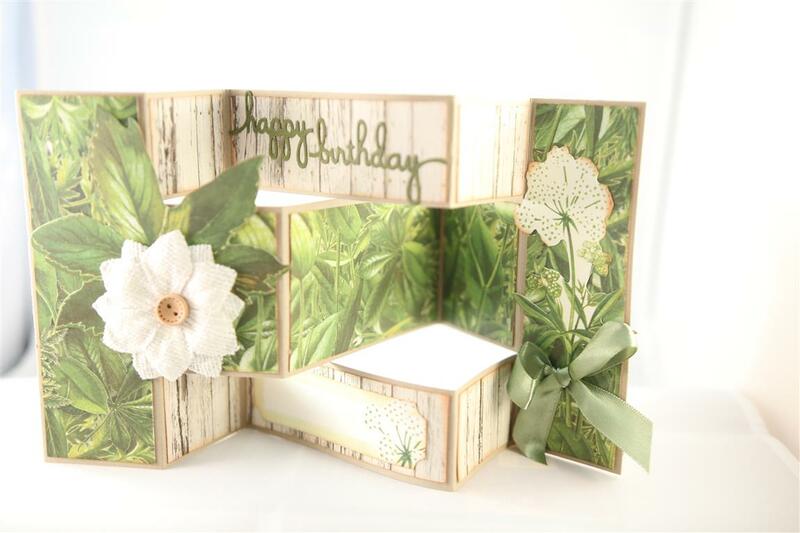 todays card is made with Kaisercraft botanica collection – the 12 x 12 papers, and I fussy cut the flower stem from some of the paper. Added a doily, ribbon bow and inked all the edges with tea dye ink. This one was a class card,as were the previous two shown. well, time for work, til tomorrow…. 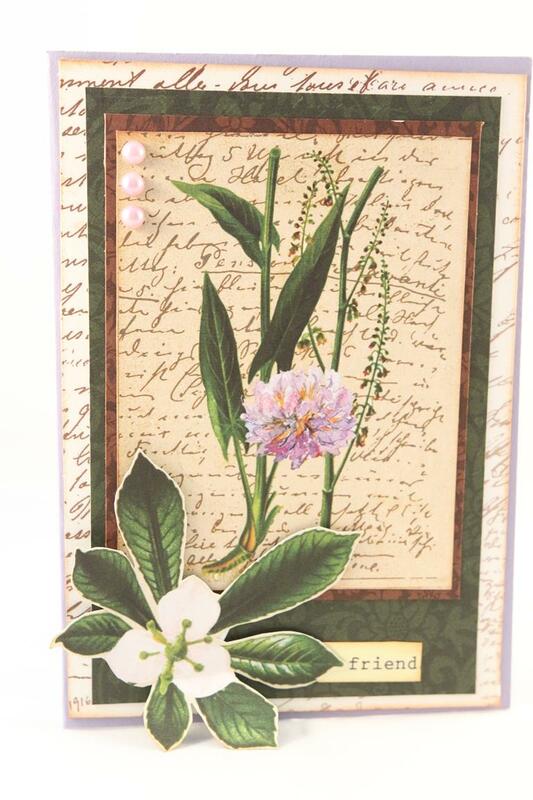 For my second Kaisercraft Botanica card I used a lilac card blank,and did some layering and fussy cutting to finish. the word Friend came from another piece of the same collection. I have spent a little time in the craft room today and I have been making a few more cards with this collection,it is lovely. I have moved on now to some graphic 45 gilded lily cards because I havent made any with all the paper I bought in that collection and thought I had better get started! all in all a great crafty day! Til tomorrow…. 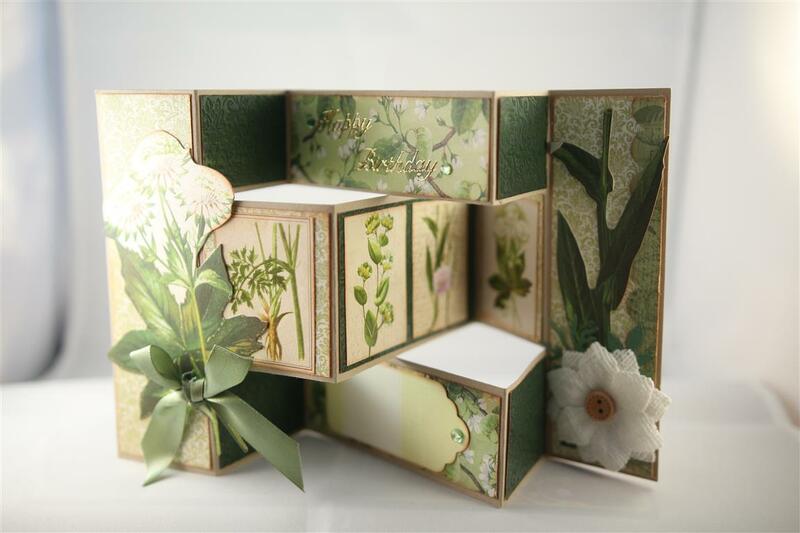 Kaisercraft botanica collection is another collection that I invested in, but have had very little time to play with. I have got a few to show you,based on lessons I did with this paper a couple of months ago, but again, can’t wait to get back to this collection and really get creative. 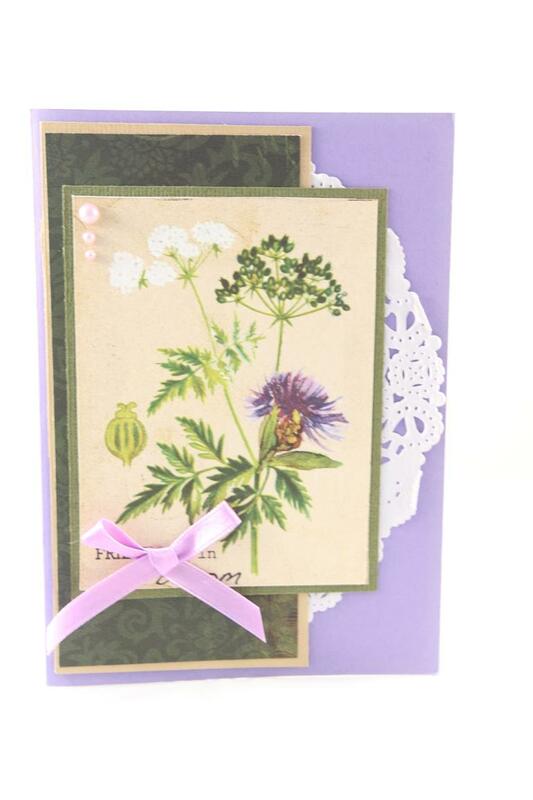 this card… Lilac cardstock for the base card, and some layering with patterned paper and plain cardstock. 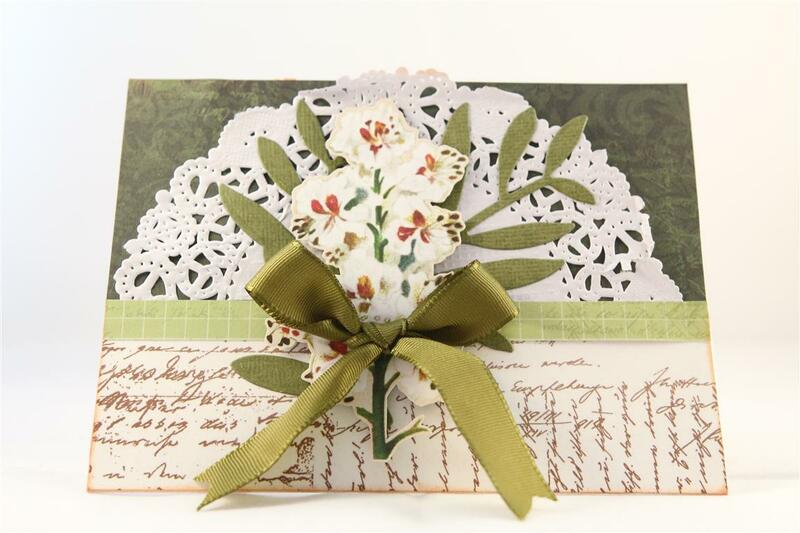 A doily and ribbon bow to decorate. while I have a minute, I would like to thank all of you that leave comments for me – it is much appreciated! Blogging is a solitary pursuit, and it does mean a lot to me to know that there are a few of you out there reading my efforts! til tomorrow….